Click on Setup & Configuration and from the drop-down menu select EOI Provider Configuration. You will need to configure the Provider(s), Division(s), and Employee Class(es) as applicable per benefit. Use the dropdown menus to select the Provider, EOI Provider, and Benefit. Enter the applicable Benefit Code as assigned by the provider. Use the dropdown menus to select the Division, EOI Provider, and Benefit. Enter the applicable Reporting Division and Billing Division as assigned by the provider. Select the Employee Classes tab. Use the dropdown menus to select the Employee Class, EOI Provider, and Benefit. Enter the applicable Eligibility Class and Sub Eligibility Class as assigned by the provider. As employees proceed through their enrollment, they may choose to enroll in coverage that exceeds a Guaranteed Issue amount and acknowledge they will answer EOI questions. Test employees need to have an SSN starting with 999 in order to be recognized by Unum as a Test Employee. The policy number entered in the benefitsCONNECT® bC4 system must be 8 characters long. If the policy number is less than 8 characters, it should be updated to include leading zeros to meet the 8 character requirement. 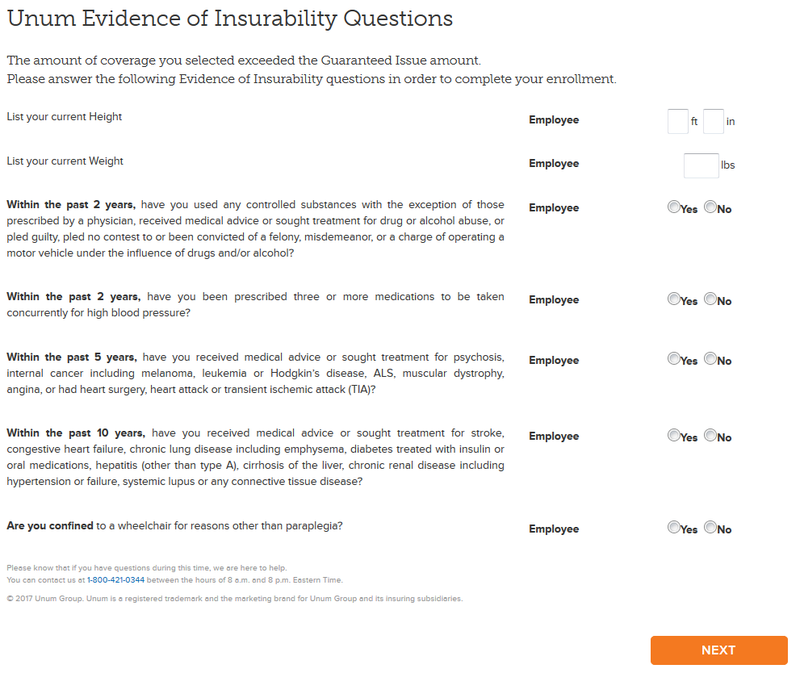 Upon completion of enrollment, the employee will be presented with the Evidence of Insurability Questions that apply to the benefit(s) they elected that exceeded Guaranteed Issue. Once the employee clicks next they are taken to the Consolidated Enrollment form and have the opportunity to review all of their elections and make any changes or click Finish Elections.